To connect diode, you must ensure that its settings correspond to the electrical circuit. In addition, before connecting the diode should be checked for serviceability, so that the device is not out of order. Equipment required: soldering iron, screwdriver, wire, knife, multimeter. Check for a faulty diode. To do this put the multimeter in continuity test mode or resistance measurement. Insights diodeand should not be attached to any equipment. Touch the probes of the findings of the diodeand then adjust the location of the probe and retry the operation. Serviceable diode should zvonnitsa in only one direction. Remember or label the output, which touched the probe of positive polarity, at a time when the diode is to be called an. This pin is called the anode. Mounting the diodein the circuit of alternating current. Do not break in the AC circuit, by cutting the wire or disconnecting it from the terminals of any electrical appliance. Strip the wire ends and solder them with a soldering iron. Insights solder the diodeand to the resulting ends, or if design allows the diodeand connect the wire using bolt connections. Mounting a diodein a DC circuit. Do not break in the electric circuit, strip and solder the ends of the wires are obtained. 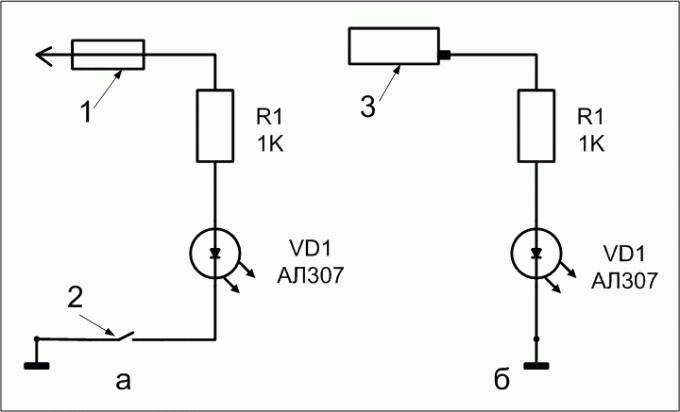 Determine the polarity of the voltage in a circuit where you intend to install the diode. This can be done with a multimeter in the measurement mode of the DC. Touch the probes to the ends of the wires, to created an open circuit. If the readings on the display are negative, then the negative or common probe is on a wire with a positive polarity. If the reading is positive, then the positive probe touches the point with the corresponding polarity. Determine the polarity of the diodeand in electrical circuit. If a diode is used as the conductive element, then connect the anode side of a point with a positive voltage. When using a diodeas a locking element, the anode is attached to the negative electrical circuit. Solder or otherwise connect the insights diodeand the portion of the circuit. All operations with the installation and dismantling of equipment should be carried out with completely de-energized circuit. Before installing the diodes, verify that the electrical parameters, such as allowable current and voltage correspond to those in force in the used electric circuit. Simplest led flashlight consists of led, resistor and battery. In some cases, is not required and a resistor. Such a lamp is less effective than more complicated, equipped with a transducer, but low price and speed of Assembly pay for this deficiency. blue or white - 3-4 V.
If you do not know the color of the led, briefly connect it to the lithium battery size 2016, 2025 or 2032. At the same time you will learn the polarity of the conclusions of the led, trying to connect it both ways. The element marking is applied on the positive electrode with a larger size. LEDs having a body (that is not implemented in the SMD version), this battery can be connected without any resistor. In any case do not short circuit the element. If LEDs having a body, you are going to use a lithium cell, size 2016, 2025 or 2032 or three series-connected miniature zinc-manganese cells, size LR41 (L736, AG3), the resistor can not be used. To power from the same power sources SMD-diode it is recommended that a resistor of about 30 Ohms. When using three elements of the brand AG13 (LR44) is the same resistor will have to deliver consistently and with a corps led. Sometimes the lights of industrial production to power blue or white LEDs include sequentially two 2016 batteries without a resistor. To do so is impossible, because it will lead to a rapid deterioration of the diode and the discharge element. When you connect the LEDs to the power source, consisting of batteries of size AA or AAA, resistor use mandatory. 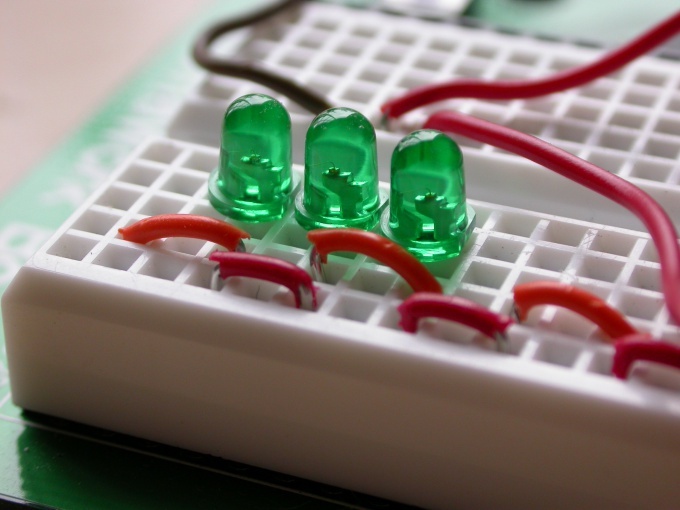 If the led is red, yellow or green, you will need two cells in series, if the blue or white three. The resistor initially take a resistance of 100 Ohms. Measure the current through the diode, and if it is more nominal, increase the resistance, if less, decrease. For diodes, rated current of which is unknown, choose it equal to 10 mA (for lighting LEDs with a diameter of 3 mm), 20 mA (for lighting larger diameter) and 3 mA (for SMD or any indicator). Then measure the voltage drop across the resistor, multiply it by the current consumption, and get released on it power. If necessary, increase the nominal power of the resistor, pre-rounding it to the nearest value of the standard series. Be sure to equip the lamp with a switch, adding it in series.